The MAI®4SPARK is a worm-pump-operated (Progressive Cavity Pump) high-performance airless pump for fillers/putties. It can be operated over transport distances of up to 100m. Airless sprayers are in high demand for those who are looking to invest in long-term coating or painting projects. A reliable paint sprayer can give you years of use and a variety of powerful functions. Airless paint sprayers are recommended for both interior and exterior projects, as they often produce more powerful bursts of paint and come in larger sizes than HVLP sprayers. This is the go-to tool for high speed painting with a smooth finish. An airless sprayer allows the fast application of paint and other materials over large areas. The MAI airless paint sprayer can be used for fine filling compounds and pre-mixed coating materials, including lime-based and cementitious filling compounds. Gone are the noisy, vibrating piston-operated airless devices of the past. 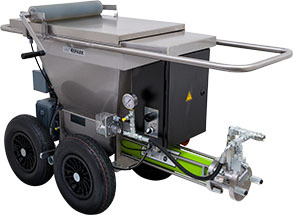 A modern paint spraying system is virtually noiseless. Brilliantly simple to operate, easy to clean and maintenance-free. Enjoy a comfortable working environment with an airless sprayer from MAI. The MAI®4SPARKairless paint sprayer will be a pleasure to use on your construction or engineering project. Talk to our experts about the high-tech MAI paint sprayer system.